Some now classic research from 2007 showed that the amount of artificial light has increased more than 100,000 fold in the last three centuries in the UK as successive advances in technology have revolutionised the availability and price of illumination. Recent research extending this work provides estimates of price and income elasticities that suggest continuing unmet demand, and interior lighting levels remain a long way below daylight. The amount of electricity required for lighting is likely to increase in the next few decades, despite continuing efficiency gains. This makes the deployment of low carbon electricity generation all the more urgent. The December 1892 issue of the Strand magazine contained the first appearance of the Sherlock Holmes story “The Adventure of Silver Blaze”. 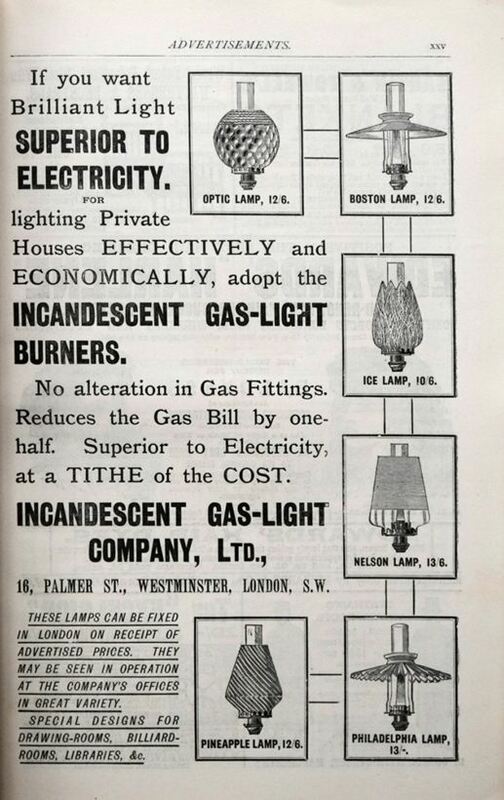 The same issue also contained the following advertisement for gas lamps, which were then facing competition from a new technology – the electric light bulb. The advertisers had a point. Even by 1900, eight years after this advertisement was placed, electricity was still 25 times more expensive per unit of energy than gas, but only 7 times more efficient, so electric lighting remained the preserve of luxury homes and commercial premises. But by 1930 electricity was only 5 times more expensive than gas and 10 times more efficient. A huge switch to electric lighting was underway, which would displace gas almost completely by the middle years of the twentieth century. This transition from gas to electricity marked one stage in the increasing availability of artificial light over the last few hundred years which has transformed the way we live. 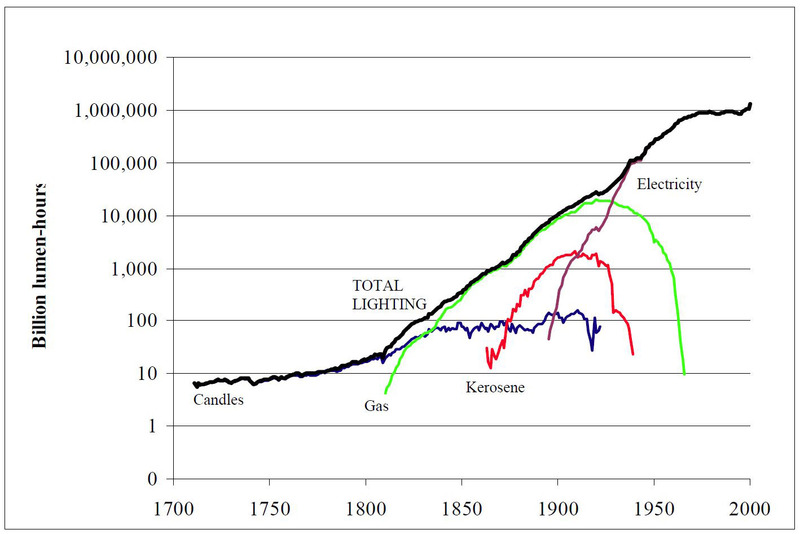 Some now classic research by Fouquet and Pearson first published in 2007 showed how changes in technologies have always been accompanied by increasing use of light (measured in lumen-hours), with consumption of lighting increasing by a factor of over 100,000 in the past 300 years. However, there appears to have been a plateau towards the last quarter of the 20th century, with a tick up at the end. This raises the important question of whether demand for lighting is saturating, or whether there is still room for growth in the demand for lighting services. If demand for lighting services is saturating then producing the same service with much less electricity may lead to substantial savings in emissions from electricity generation. However if demand has not yet saturated, increases in efficiency through the wider deployment of new technologies, especially LEDs, could lead to lower than expected savings, as increased efficiency reduces price per lumen and so increases demand, a rebound effect. As a first step in looking at this, I’ve taken the data from the analysis and plotted it on a log scale. 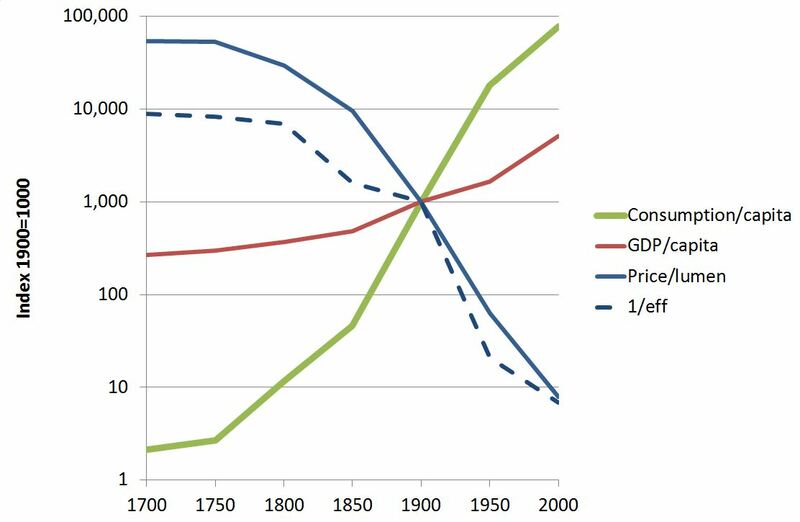 This shows clearly how consumption has increased as population and incomes (measured by per capita GDP) have risen and prices have fallen. The central role played by efficiency is indicated by the dashed line, which shows the number of kWh needed to produce a unit of light (1/efficiency). Comparing this with the solid blue price line showing price indicates that the 100 fold fall in price per unit of light in the 20th century was due to increased efficiency, mainly as electricity replaced gas. Yet demand rose strongly over the period, increasing more than 100 fold. This challenges the view that increases in efficiency translate into reductions in demand, and thus emissions. There seem to be at least three good reasons for suggesting that demand for lighting services will continue to grow strongly in the coming decades. First, interior light levels are still well below the intensity of daylight, by as much as one or two orders of magnitude. There is no immediately apparent reason why people should have an intrinsic preference for lower light levels than found naturally, at least for much of the time, and especially in winter. Second, every major technological shift has caused an increase in the consumption of lighting services in the past. LED lighting now appears, together with other technologies, to be introducing such a major technological shift. There will surely be significant progress in the coming decades, with costs falling and the quality of the light improving. If the historical pattern is followed this will lead to an increase in demand. Third, incomes will continue to rise, which is also likely to lead to an increase in demand. In their more recent research Fouquet and Pearson have estimated both price and income elasticity of lighting demand over time. They have found that both income and price elasticities have fallen below the very high levels found in the late nineteenth and early twentieth centuries. But they are still materially different from zero. Demand for lighting services can be expected to grow even in a mature market such as the United Kingdom over the next half century, given expected increases in income and reductions in the price of lighting services. Estimates indicate that despite increases in average efficiency of lighting of 2% p.a. electricity use for lighting could still increase by more than a third in the coming decades. Even if elasticities do fall somewhat over time, with greater demand saturation than yet evident, and other cost increases somewhat offset price falls due to efficiency there will be major limitations to the ability of lighting efficiency to produce very marked percentage reductions in emissions relative to current levels. 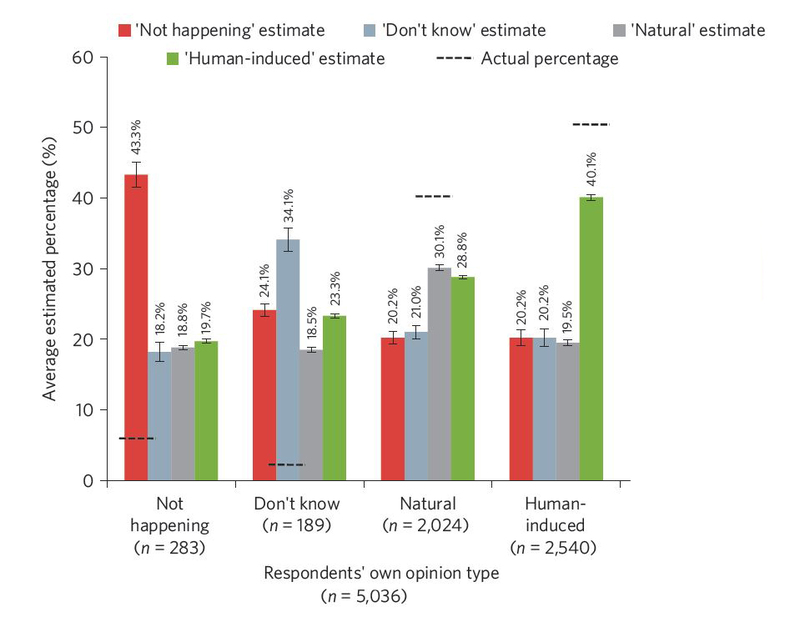 Source: Fouquet and Pearson 2012. One of the authors has since refined these estimates (Fouquet 2013) but this does not greatly affect the general pattern or current values. This analysis does not necessarily generalise to other services. Lighting remains a minority of total electricity demand even in the residential sector, and there may be greater saturation effects in other applications, for example in some domestic appliances. For example, energy use by refrigerators sold in the US has declined enormoursly since the mid-1970s. However other sectors, such as passenger transport and domestic heating, also show continuing growth in demand for energy services over the very long term, confirming that the type of trend found for lighting is not unique. Increased lighting efficiency, however desirable, thus seems unlikely to do much to avoid the need for very large amounts of low carbon electricity generation. Efficiency will help but it will be nowhere near enough on its own. Fouquet, R. and Peter J.G. 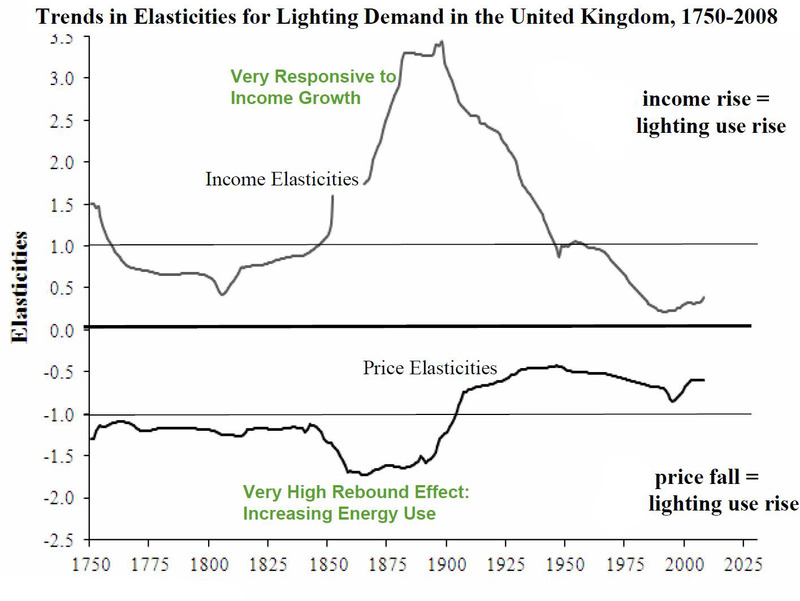 Pearson (2012) The long run demand for lighting: elasticities and rebound effects in different phases of economic development.‘ Economics of Energy and Environmental Policy 1(1) 83-100. This entry was posted in energy efficiency and tagged climate change, climate change policy, energy efficiency on 18/04/2013 by adamwhitmore. Do you need an emissions trading scheme to trade emissions? Emissions performance standards for power plant could be given considerable flexibility by allowing trading between emitters that are covered by a standard. This would achieve many of the benefits of emissions trading, at least in the power sector, without the need for a full-blown cap-and-trade scheme. In the US this could be implemented by the EPA using existing powers under the Clean Air Act without the need for legislation in Congress. My previous post looked at the spectrum of possibilities between emissions trading and taxes. This post looks at the potential overlap between emissions trading and performance standards. Emissions trading is usually considered to offer a more cost-effective means of reducing emissions than prescribing performance standards, because trading allows flexibility to achieve reductions wherever the costs are lowest. However a Federal emissions trading scheme for greenhouse gases in the USA still appears to be a distant prospect. Instead the Environmental Protection Agency (EPA) is required under the Clean Air Act to impose performance standards, with a duty to regulate emissions from existing power plants under Section 111(d). Under this Section of the Act the EPA sets guidelines, and individual states must come up with State Implementation plans (SIPs) that conform to these. If the EPA guidelines are inflexible, following a traditional approach, this has the potential to lead to inflexible regulation, and consequently either limited effectiveness or a risk of high costs. However Section 111(d), which has rarely been applied in practice, appears to offer substantial flexibility around the type the performance standards that can be imposed. In particular, tradable emissions standards appear to lie within the legal scope of Section 111(d). Such tradable standards could be implemented by the EPA for the power sector without further authorisation from Congress, unlike a cap and trade system. Indeed they have previously been used in a limited fashion to implement the phase-out of lead in gasoline[i]. Under this type of approach the EPA would set a standard, but allow emitters to trade so that the standard is achieved on a sector or sub-sector wide basis, rather than by each emitter individually. Those with emissions lower than the performance standard would be able to sell credits to those with emissions higher than the performance standard. As multiple such trades were established this would effectively create a carbon price, in the form of a price for credits generated by entities outperforming their standard, for which entities with emissions above their standard would be willing to pay. Regulation would thus in effect enable a per MWh emissions limit (i.e. an emissions intensity cap) on the all or part of the power sector that would be very similar to a sectoral baseline and credit trading scheme. However, unlike a cap-and-trade scheme it would not impose an absolute limit on emissions. The least contentious form of tradable standard for the power sector would probably set separate standards for coal and gas fuelled plant, and perhaps further differentiating standards by plant technology. Trading would only be allowed between plants using the same fuel and technology. This would allow some flexibility in complying standards, for example by improving thermal efficiency and adjusting plant dispatch. However gains may be relatively small in view of the similarity in performance of much US coal plant. Much greater gains would be possible if the EPA were to impose an average performance standard covering all fossil fuel generating plant and allow trading between coal and gas plant. Crucially, this would allow standards to be met by displacing coal with natural gas, taking advantage of the lower emissions and higher efficiency possible with generation from natural gas. It would in principle also be possible to set separate standards for different types of plant, but with trading between the different types of plant still allowed. However this would risk displacing relatively inefficient gas plant with coal plant that is efficient relative to its own standard, but still with higher emissions than the gas plant, making such an arrangement a poor policy choice. A recent proposal from the Natural Resources Defence Council (NRDC) [ii] goes further in suggesting the inclusion of actions by the utilities to increase the deployment of low carbon power and to improve end use energy efficiency. NRDC’s modelling shows that energy efficiency has the potential to displace a large amount of generation from coal plant. However, extending credit for emissions reduction effectively allows for offsets from outside the scope of regulated activity of fossil fuel generation. It is not clear that EPA has the power to implement such as solution, even if it allows for lower cost emissions reductions. If the EPA were judged to have such power this approach would still raises significant challenges in implementation. Although there are already protocols in many US states for calculating efficiency gains there may be substantial administrative challenges in adopting and adapting these in the context of a tradable standard. However, meeting such challenges may be justified if the substantial gains indicated by NRDC’s modelling could indeed be realised. There will be other issues to resolve in designing tradable standards, including whether credits can be banked from one year to the next, how standards will change over time, and how standards will interact with State level cap-and-trade schemes such as the Regional Greenhouse Gas Initiative (RGGI) and the California ETS. However, each of these appears tractable. For example, state level schemes could simply be required to demonstrate equivalence with the EPA rule. Tradable standards appear to offer substantial advantages over less flexible regulation, and show that some of the advantages of emissions trading can be realised without a full cap-and trade scheme. And they appear legally and politically much more tractable than a cap and trade scheme for the USA. In the context of current US politics they represent a compelling policy choice. This entry was posted in carbon pricing, power generation and tagged carbon pricing, climate change, climate change policy, emissions trading, power generation on 11/04/2013 by adamwhitmore.